"If you want to quickly know if you're going to like Giles Martin's The Beatles remixes start with "Long, Long, Long." If you don't like that one, you're probably not going to like the rest, but for me, that remix in particular is far superior to the one on the two original "Top Loader" U.K. pressings I have: more transparent and more spacious, with a holographic George front, center and three-dimensional as he's not presented on the original. ... Martin left mostly intact what was familiar and comfortable to long time listeners. If anything, the vocals sound richer, more velvety and more coherently believable than on the original. ...All of this said, the reissue does not sound like the original U.K. pressing nor was it intended to. Yet it remains true to the original's intent, in part because there was less Mr. Martin could do to change it." — Michael Fremer, Analogplanet.com, Oct. 23, 2018. Read the entire reivew here. The famous album's 30 tracks are newly mixed by producer Giles Martin, son of original album producer George Martin, and mix engineer Sam Okell in stereo and 5.1 surround audio, sourced directly from the original 4-track and 8-track session tapes. This new mix is complemented by 27 early acoustic demos and 50 session takes, most of which are previously unreleased in any form. This reissue represents the first time the album has been remixed and presented with additional demos and session recordings, although several were released on the group's "Anthology" collections in the 1990s. These include the outtakes "Not Guilty" and "What the New Mary Jane?" as well as early versions of John Lennon's "Child of Nature" (later released as "Jealous Guy"), Paul McCartney's "Junk" and George Harrison's "Sour Milk Sea." 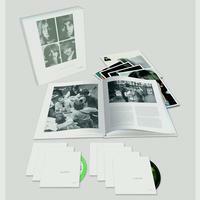 The multi-format box set's six CDs and Blu-ray disc are housed in a slipsleeved 164-page hardbound book, with pull-out reproductions of the original album's four glossy color portrait photographs of John, Paul, George, and Ringo, as well as the album's large fold-out poster with a photo collage on one side and lyrics on the other. The book's written pieces include new introductions by Paul McCartney and Giles Martin, and in-depth chapters covering track-by-track details and session notes reflecting The Beatles' year between the release of Sgt. Pepper and recording sessions for The White Album.